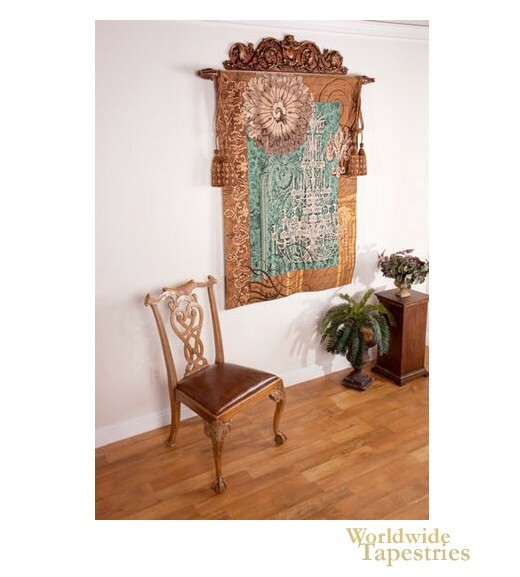 This French tapestry shows an abstract piece based on rosettes and chandeliers. A montage of architectural elements, this tapestry shows an abstract work of curves, rosettes and chandelier motifs, in gold and turquoises. This French tapestry "Architectural Study" is backed with a lining and has a tunnel for easy hanging. Note: tapestry rod, tassels and accessories, where pictured, are not included in the price.